Today is my mother’s birthday and I felt like re-sharing one of my mother’s favourite recipes. 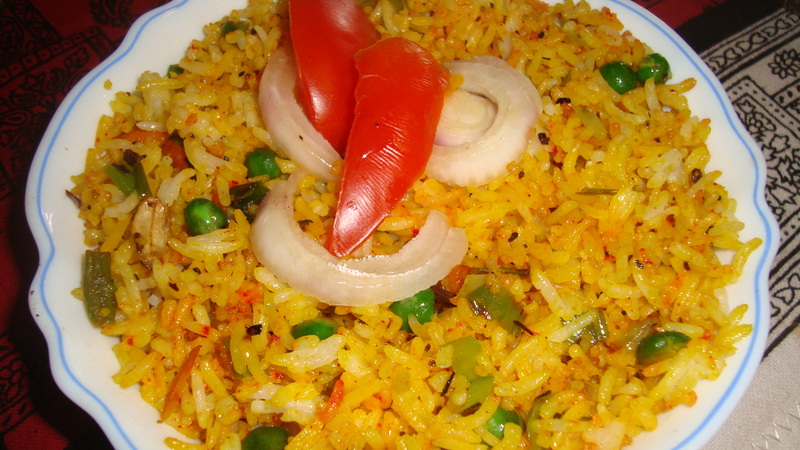 Odiyal Kool is a traditional dish from north Sri Lanka and can be made as a vegetarian or non-vegetarian version. Today’s recipe is a vegetarian dish. For today’s music feature, I wish to share some song clips from youTube from the official vevo site of one of my favourite singers – Andrea Bocelli. The first is a music video of the song ‘Canto Della Terra’. The second song ‘Con Te Partiro’ is from a 2011 concert. I liked more an earlier version, where he sings with Sarah Brightman, but could not find it on the official site. The last clip is the music video of the song with Laura Pausini ‘Dare to Live’. Hope you enjoy the music and the recipe! Dry grind the cumin seeds, red chillies and pepper and keep aside. Boil the vegetables in a pot with half litre water. Add another litre of water, along with the tamarind extract. As the water comes to a boil, slowly stir in the odiyal flour, avoiding lumps. Add the boiled rice to the pot. Add the ground spice mixture and the turmeric powder to the pot and salt to taste. Let it come to a boil. You can add a little water to adjust the consistency to your liking, e.g. if the water has dried up or you prefer a watery Kool. Serve hot in medium-sized bowls. 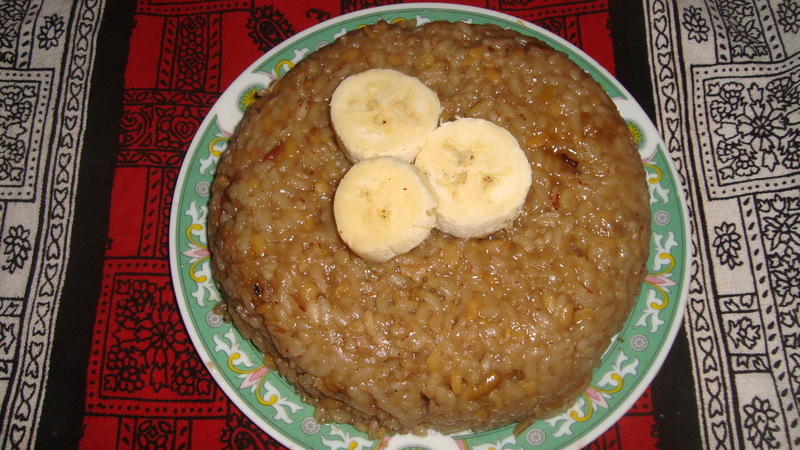 Today (or rather, tomorrow) is Thai Pongal festival celebrated by Tamils around the world. It is a harvest festival celebrated at the end of the harvest season in the tenth month (தை, Thai) of the Tamil calendar and is a festival offering thanks for a bountiful harvest (pongal, which also refers to the sweet rice dish made on that day) and for a prosperous year to come. In Sri Lanka, it is usually celebrated for a day whereas in India, it is a 3 or 4 day festival with a day celebrating the hard work of the cattle in the fields the previous year. I am re-sharing the pongal recipe that I posted last year. One of my close friends and her family visited me last week which brought back pleasant memories from over a decade ago when I had first met her. So, for today’s music, I would like to feature the songs of a musician from her country that she introduced me to. The first song is one of Dulce Pontes’ famous songs – Canção do Mar from her album (Lagrimas or Tears, 1993). This song was covered a decade later by Sarah Brightman. Dulce Pontes contributed to the popular revival of Portuguese folk, Fado, in the 90s. The second song is one such song. Hope you enjoyed the Portuguese music shared today and that you do try out the Pongal recipe! Happy Pongal! Wash the rice and gram and cook them in a pot with 2 ½ cups of water. Cook for around 15 to 20 mins, till the water dries up. Grind and extract coconut milk by blending the freshly scraped half of a coconut with 1 cup of water. Once the rice and gram is cooked, add the grated jaggery and mix. Then, add the coconut milk and crushed cardamoms. Bring to a boil on high heat and cook for a few more minutes before reducing the heat. Add the chopped cashew nuts. Cook until the pongal mixture starts coming together and starts to thicken. Just before removing from heat, add the raisins and mix. I have been trying out different muffins over the last few months and I was in the mood of trying out some experimental muffins. I wanted to create some muffins which had a strong leaning towards a Sri Lankan dish. While thinking about using different local non-wheat flours, inspiration struck. I do very much like the delicacy – mothaham or kolukkattai, that my mother makes during special festivals like the ongoing Navarathri festival. I decided to try out the muffin version of this steamed dish and it turned out a cross between a muffin and a crumble. I am sharing it at both my brother’s birthday today as well as bringing some over to Fiesta Friday tomorrow. The music selection for today focuses on some lovely Persian music. The first group featured here is the Chemirani Zarb Trio, a classical percussion group. I first heard their music when they visited Sri Lanka to perform at the WOMAD concert 2005. The clip I share here is one of their performances at another WOMAD concert. While searching for Chemirani Trio clips on youTube, I came across a few other Persian groups that I liked. The second clip is a music video by the folk group Zâr Ensemble, formerly known as the Ensemble Shanbehzadeh. The last clip is a beautiful one by classical singer Homayoun Shajarian and instrumentalist and composer, Tahmoures Pournazeri. Hope you enjoyed the lovely music as much as I did! As usual, please do share which clip you liked more. Melt the margarine and let it cool slightly. Mix the freshly scraped coconut, green gram, jaggery and cardamom in a bowl. Add the coconut and gram mix to the melted margarine. Stir to mix the contents a little. Sift the rice flour and all purpose flour together. Add the baking powder and salt and mix. Add the flour mix to the wet ingredient mix. If the resulting mix is too dry, just add a little oil until it is sufficiently moist. Bake the muffins for about 25 – 30 mins at 180C. Serve warm with a hot beverage. I had tried to get hold of some of the Sri Lankan Burgher cuisine recipes for some time now. While some of the dishes such as lamprais, frikkadels and some kinds of specialty cakes around Christmas time are very popular and are recreated by cafes and bakeries around the country, I was more interested in the home-cooking of Burgher families. Besides Refinceyaa who shared her aunt’s recipe for capsicum with eggs on this blog, I had also asked Trevor Martil who is another of my former colleagues. He recently sent me some of his mother’s favourite recipes. 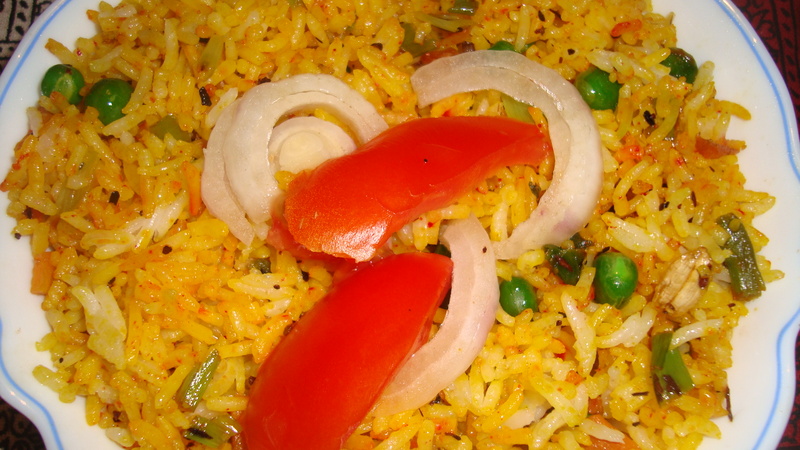 Today’s recipe is one such dish, which Trevor’s mother calls ‘savoury rice with a difference.’ This rice recipe (providing both vegetarian and non-vegetarian options) is what I am sharing at Fiesta Friday together with some special music clips. The special song clip for today is a rendition, by Amitabh Bachchan, of renowned poet and Nobel Laureate Rabindranath Tagore’s beautiful Bengali poem Ekla Cholo Re written in 1905. This song is from Sujoy Ghosh’s acclaimed Hindi movie Kahaani (translation: Story, 2012) starring Vidya Balan. Translation of the lyrics can be found on Wikipedia. The next song clip is from Aamir Khan’s talk show Satyamev Jayate (translation: Truth alone prevails). Composed by Ram Sampath for the lyrics written by Swanand Kirkire, Meenal Jain sings the beautiful Hindi song ‘Sakhi’ at the end of the episode on domestic violence. I think I must have watched all the episodes of the first season in 2012. Hope you enjoyed the songs and do let me know if you tried out the recipe today! Temper spices, star anise, onions, curry leaves. Add cooked rice, 1/4 cup milk, turmeric. Allow to simmer. Add green peas, eggs and stir in a tablespoon of butter. Cut chicken into small pieces, marinate in soya sauce, and place in a pan. Cook till water is absorbed. Add oil and stir-fry adding all vegetables, onions, ginger, garlic sauces and 1/2 cup chicken stock. Cook and take off heat with gravy. Sprinkle parsley and coriander leaves. Serve hot. Spicy Curd Rice From Ahila! Re-blogging Susan from Watch Hatch Fly‘s lovely version of the spicy curd dish… Thank you, Susan, for trying out the recipe and sharing! Warm greetings from sunny Colombo! We spent the last several days at the lake. Vegans don’t require ammo or bait, and the blackberries aren’t ripe yet. So, we pack! I wish to wrap up the rice series by re-posting a delicious fried rice recipe from the first month of this blog. To go with this post, I chose to feature two musicians who were born in Sri Lanka and started their music careers here. They have expanded their musical repertoire since moving/ migrating to the west in the 80s and have made some impressive music. This song is a recording of a bhajan at the sacred music and dance festival held in Berlin last year. Finishing this post with an upbeat song – Herb Alpert and Lani Hall Quintet’s version of Puttin’ on the Ritz from their grammy award-winning album Steppin’ Out. The second musician I am featuring today is Hussain Jiffry, the bassist in this quintet. He has worked with several musicians including Sérgio Mendes and Yanni. Cook the rice together with a cinnamon stick, rampe leaf and a little salt. Chop up the vegetables and sprinkle a little salt over them. Keep aside. Heat the margarine in a pan over low heat. Add the mixed 3C spice powder and sauté for a couple of seconds before adding the chopped vegetables. When the veggies become tender, add the kesari powder. Add the cooked rice and mix well.